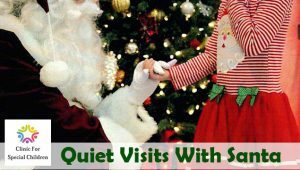 Airlie Gardens is proud to partner with The Clinic For Special Children for Quiet Visits With Santa. The goal of “Quiet Visits With Santa” is to let every child take part in a holiday tradition. Through peaceful one-on-one appointments, we remove the chaos and loud noises that come with large crowds, and give your child a soothing memory to last a lifetime. This event is by appointment only and space is limited. Call (910) 319-7744 to schedule your appointment today!